Be frank: Does Detroit’s new poutine hot dog look finger-licking good? The Arizona Diamondbacks’ $25, 18-inch, bacon-stuffed monstrosity is not the only big dog in the league. The latest artery-clogging heavy hitter in the ballpark eating world comes from Detroit. Comerica Park has introduced four new $7 dogs to the Tigers’ ballpark menu lineup, according Crain’s Detroit Business. There’s the Late Night Dog — a frank with a fried egg, bacon and cheddar cheese. Then there’s the Pork & Beans — a hot dog bathed in baked beans, cheddar cheese and bacon. And don’t forget the Slaw Dog, where a frank hangs out with coney chili and cole slaw. 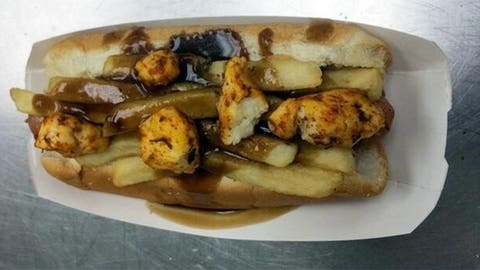 But the one we’re most intrigued by is the Poutine Dog, in which a natural-casing frank is lovingly slathered in fries, cheese curds and gravy for a finger-licking, cholesterol-laden treat.